Banking service in Bangladesh is characterized as a highly competitive and highly regulated sector. With a good number of banks already in operation and a few more in the pipeline, the market is becoming increasingly competitive by the day. With the global slowdown in the face of rising competition, the commercial banks are constantly looking for ways to develop their market and product offers to remain ahead of others. A significant amount of regulation by Bangladesh Bank prevents the scope of introducing newer products into the market and thereby restricts a banks’ ability to outperform others with a diversified product range. However, recent trends have shown banks shifting away from vanilla products (basic products) towards higher value added products that are highly structured, to meet the needs of the clients. Standard Chartered Bank is the oldest multinational bank operating in Bangladesh. It has, over the years, created one of the largest networks among all the foreign banks in Bangladesh. Although a trendsetter in offering a various range of products in the market, the product offers of Standard Chartered Bank are quickly imitated by competitors. Substitutes offered by other commercial banks make their way into the market and thereby eat a portion of the margin. An idea of the current portfolio structure of nationalized, private and other foreign commercial banks has helped to generate ideas regarding the areas that Standard Chartered itself can explore into. Having established itself as the leading foreign commercial bank in Bangladesh is not by itself sufficient unless a hearty attempt is made to sustain this position. Amidst an age of regulation and intense competition, diversification of the corporate products in a way that helps to increase the wallet share of the bank and thereby achieve growth is undoubtedly very desirable. Based on above, this report looks in depth towards the opportunity for Transaction Banking. In spite of some limitations, I have tried at my best to make a good report to fulfill my aforesaid objectives. I shall be successful if this report helps anyone for study or future experiment. –A Study on Standard Chartered Bank”. During the internship period, I am required to prepare a report on the organization where I have been attached. My supervisor Ms. Shyamali Biswas, Assistant Professor, Department of Business Administration, STAMFORD UNIVERSITYBANGLADESH’’­­- assigned me this topic. The internship was conducted from 15th June to15th September 2010. The present study was not out of limitations. But as an internship student it was a great opportunity for me to know the banking activities of Bangladesh, especially of SCB. Standard Chartered Bank (SCB) Bangladesh (the bank) commenced its banking operations in Bangladesh in 1948 after obtaining banking license from the central bank. Standard Chartered Bank is incorporated in England by Royal Charter (1853), to be read in conjunction with Standard Chartered Bank Act 1984. The liability of its stockholder is limited. As per the asset purchase agreement (APA), between Standard Chartered Bank England and Standard Chartered Grindlays Bank (SCGB) Australia dated 23 December 2002, which has been duly approved by Bangladesh Bank, SCB took over all assets and liabilities of SCGB and commenced operations as a combined legal entity with effect from 1 January 2003. The principal activity of SCB Bangladesh is to provide a comprehensive range of financial service, commercial banking services, cash management treasury and security and custody service. Standard Chartered Bank started its’ business in Bangladesh in 1948, opening its first branch in the port city-Chittagong. The bank increasingly invested in manpower, technology and premises as its business grew in relation to the country’s thriving economy. At present the bank has 26 offices in Dhaka, Chittagong, Sylhet, Khulna, Bogra and Narayanganj including the country’s only offshore banking unit inside the Dhaka Export Processing Zone at Savar. It also has several ATM booths and a well-opened Auto Billspay services. Extensive knowledge of the market and essential expertise in a wide range of financial services indicate its’ strength to build business opportunities for corporate and institutional clients at home and abroad. It generates new products and services to match the specific requirements of customers. In Bangladesh Standard Chartered offers 24-hour service through its Moneylink ATMs. Continuous upgrading of technology (especially in IT sector) and control systems has enabled the bank to offer new services, which include unique ATMs, Call Centre and Auto Billspay service. Standard Chartered Bank’s services in Bangladesh, ranges from Personal & Corporate Banking to Institutional Banking and as well from Treasury to Custodial services. With over 150 years of experience in trade finance and an extensive international branch network, Standard Chartered is committed to help customers succeed in every competitive environment. SCB applies state-of’-the-art technology to automate daily operations and electronic delivery system has been put in place to ensure that transactions are handled swiftly and efficiently, it adopts a proactive approach in tailoring customized packages to meet customers’ ever- changing needs. History- A Year wise progression of the Standard Chartered Bank. Set up by James Wilson in 1853, at the request of Queen Victoria, the Standard Chartered Bank aimed to finance and manages trade between the British Empire and its colonies in India, Australia and China. It mainly operated in Asia-Pacific, Latin America, the Middle East and Africa. The overseas branches of the Chartered Bank opened in Calcutta, Bombay and Shanghai followed by Hong Kong and Singapore in 1859. The Standard Bank is incorporated in England and under the new title of The Standard Bank of British South Africa Limited. The Chartered Bank and The Standard Bank incorporated as Standard and Chartered Banking Group Limited. Merger of the Standard Bank and the Chartered Bank by the incorporation of Standard and Chartered Banking Group Limited. 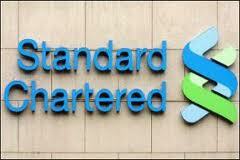 Standard Chartered acquires the Hodge Group, whose operating company later becomes Chartered Trust Limited. Parent company of the group renames Standard Chartered PLC. Standard Chartered Bank becomes a clearing bank within the UK clearing system. Received the very first ‘Best Bank in Asia’ awards from Euromoney magazine. On 27 April, ANZ announced the sale of its Grindlays businesses in the Middle East and South Asia, and associated Grindlays Private Banking business, to Standard Chartered PLC. ANZ announces US$8 million strategic investment in Hong Kong, online stockbroker, BOOM.com. ANZ announces sales of Grindlays to Standard chartered for US$I.3 (A$2.2) billion in cash. Number of shares 1,174,520,020. Number of employees (31/12/2008) 30,000. It has 500 branches in 56 countries. At present the bank has 26 offices in Bangladesh. America Middle East-Egypt, Lebanon, Oman, Bahrain, Jordan, Qatar, Kuwait, Saudi Arabia, UAE. Regulators: Exemplary governance and ethics wherever SCBs are. Management Discipline: Continuously improving the way we work, balancing the pursuit of growth with firm control of costs and risks. This account is eligible for individual’s savings, transaction, investment, loans repayment and payroll purpose. It comprises of savings, current, access, and Islamic current account. There are also foreign currency account (FC) and resident foreign currency accounts (RFCD). Requirement for personal account: current, savings and access (single) and graduate account. >. AOF: The account opening form (AOF) completed properly. >. Photograph: One copy of account holder photograph duly signed by introducer. >. Nominee: Signature of nominee on the AOF along with the relevant portion and also with a photo duly attested by applicant. NB. Any kind of over writing must be signed by applicant in AOF. Name, father’s name, mother’s name, date of birth, address, have to match with supplied documents. Transaction profile and MID (Most important document) are the integral parts of all account opening. Usually it is introduced for the wage earners out side Bangladesh. It is also a foreign currency account. In addition to the normal requirement job contact letter, copy of utility bill to verify address (if applicant inscribes foreign address) are also necessary .Any Bangladeshi nationals who receives salary in non local currency can also open this account. Requirement is almost same. This is a foreign currency account, usually dollar/GBP/Euro transaction account. A person who needs to visit outside Bangladesh can open this account within 30 days of arrival. In this kind of contract it is mandatory to get an international credit card. This account opening needs approval from head office. This account holders does not get any cheque book or Debit card, they only posses the right to deposit and withdraw foreign currency over the counter (through showing passport). Minimum amount is $1000 or 500-pound. Code of this account is 01. This is only for the current graduate students. It is a interest bearing saving account. The minimum balance of the account is BDT 10,000. If the account holder maintains BDT 10,000 on average per month then he /she earns 2% interest per annum, which will be calculated on daily basis but to be credited half yearly. Maximum debit card withdrawal is permitted BDT 5000 per day. – No of years & credits completed. Statement is send to the correspondence address of the account holder according par instruction. Some time students need bank statement on urgent basic for visa purpose. At that time we receive a request in a prescribed form with verifying signatures. We then deliver the statement in the next working day. We charge 200 and 15% vat for statements for last one year over the counter. If he/she requires more than one-year statement then we have to send the form to account service and it takes 3 days for delivering. Preparation of Statement of Certificate is a complicated one. It is normally for tax purpose. We give certificates concerning interest received and tax deducted at sources on the account. We give certificates after investigating account’s existing information or taking documents from customer. It is charged from his/her account. We don’t mention the word “Solvent”. It is completely restricted. We may add another statement according to customer instruction after safe guarding the bank. NB: No statement or certificate would be delivered if minimum balance of the account is below 230. Every ATM card has an expiry date. It requires replacements. I received a request for ATM service and delivered it to account section. Customer collected it after 3 working days. ATM replacement / new issue charge is 345 (300+ vat). Every Debit card has an expiry date. It as well requires replacements. The request for debit card (with prior notification) is dealt by the account service department. Customer collects the card after 3 working days. Debit card replacement / new issue charge is 345(300+ vat). Now SCB is issuing only debit card and at present SCB has stopped issuing any ATM cards. Customer can easily withdraw cash and make purchases whenever he/she wants using this Debit card. Customers sometime want to change mailing and permanent address. They have to fill up a form and give supporting documents for address alteration (in case of permanent address change). Supporting documents should be photo id (passport/driving license/ voter id or reference letter by first class gazatted officer) and one copy of photograph of the account holder is required to change any kinds of account service form. This is free of cost. Sometime customer wants to add new person or nominee as joint signatory. Customers have to fill up a form and a signatory card where new applicant’s signature (duly attested by him/her), a copy of passport or voter ID or driving license is required. Signature Change: If a customer wants to change his signature he has to provide his previous valid documents (which was supplied at the time of account opening) and a copy of photograph with a complete form. Customers have to surrender his cheque-book and ATM card at the time of closing or surrendering the account. Closing charge is 575+ excise duties (it is applicable if customer has more than BDT 1, 00,000 bal. in last 6 month + any DR (debit balance) balance). Locker holder is charged BDT 250,350 or 450 for per month. Customers are not allowed to visit if his account balance is not sufficient to deduct charges (yearly & per month charge). If any one wants to surrender the locker, s/he needs to surrender the locker key and visit the locker finally with custodian. The manager keeps the key in the volt and reallocates it. — Receives information on foreign currency exchange rate. Information regarding other products & services of Standard Chartered Bank. Providing instruction from customer to prepare pay order/ demand draft, which are to be collected at the branch. When the customers apply for their loan individuals UDC/PDC (previously given by him) comes back to the branch. Entry in a registrar is given and then locked in a box. When customers come to receive it, we receive an acknowledgement from him and give him UDC/PDC after verified signature. Over the counter I have respond to customer queries. Common quires was account balance, money arrival, account opening, account closing, ATM replacement, cheque book stop, ATM stop or Debit card, loan closing etc. Minimum balance required USD 1000 or GBP or equivalent. No interest is to be accrued if the balance falls below the minimum amount. Interest rate is based on international market rate and Bangladesh bank guidelines are to be advised by global market to all branches from time to time. Minimum balance required BDT 250000. If the balance falls below 2500000, no interest will be accrued. Interest rate is 3.00% to 5.00%. Minimum balance required BDT 250000. If the balance falls below 2500000 no interest will be accrued. Interest rate is 3.00% to 7.50%. Overdraft cash line is an overdraft facility. The limit of the facility is 90% of the security value pledged to SCB. Cash Line Fixed Loan is an installment loan payable process in either monthly or quarterly installments. The amount that the customer has withdrawn can pay in monthly installments, which is called EMI-Equated Monthly Installments. Fully cash secured means that customers can receive loan by pledging a security that is either cash or can be very easily converted to cash. The amount of the loan is equal to the value of the security. The securities that SCB considers can be easily encased are Government issued security bonds, ICB units, Fixed Deposit Accounts of SCB. Since this is a fully cash secured facility’, security has to be more than the loan amounts. Generally, 80% to 90% of the security present value is approved as loan. Loan amount is determined by the present value of the security, not the face value. Value means the amount of money that one would receive if he en cashes the security today. Sometimes, present value of a security is more than the face value because of interest accrued on the security. The difference between the two is that, present value is always higher than the face value of the security because present value contains interest receivable amount, if any. The calculation for cash line loan amount is determined by present value. Both Salaried executives and self-employed/businessmen can get Cash Line. Customer’s can get Cash Line for any of the following reasons: House-renovations, Purchase of Personal Computers, Marriages in the family, Purchase of refrigerators, Advance rental payments, Purchase of furniture, Office renovations, Hospitalization or other emergency medical needs, Higher professional or tertiary education/professional training, Purchase of office equipment/ accessories, Purchase of miscellaneous household appliances. Note: Cash line can be taken for reasons that are not mentioned above, as long as it is not illegal. For Cash Line OD, the facility has to be renewed annually. The loan will be disbursed by crediting the account of the client. The customer mentions the account where the loan will disburse or the account that an overdraft limit will be attached to. If the applicant does not have an account with us an account is opened with “zero balance” for the loan purpose. # Processing Fee: 1% of approved loan amount or BOT 2000, whichever is higher. # Other Charges: BDT 1000 for overdraft renewal charge at annual interval. Customers will repay the loan by Monthly Installments for Cash Line Fixed Loan and for Bullet Payment arrangements, customer’s a/c holders and SCB non-a/c holders can debit their access account monthly. They can put a standing order in their a/c that will automatically take the EMI every month. . The benefit of Standing order is, that it can be set for any date of the month. They can give Post Dated Cheques (PDC) s for the entire loan tenure. The PDC s will be dated 1st, 8th, 15th or 26th of each month where the Customer will have to choose one date among the four for all UDC s.
How will the Customers Repay the Loans? Cash Line OD is a utilization-based product. Interest is based on utilization. Interest is charged daily on the utilization. At the end of the quarter the accrued interest will “hit” the collection account. Since all Cash Line OD customers are SCB account holders, a standing order will be in place on the transaction a/c, which will automatically transfer the interest amount to collection account. Undated Letter (authorizing the bank to en-cash security its- discretion). A dated letter authorizing the bank to put date on the undated letter. Letter of Lien & Set-off over Deposit a/c (in case security is FDR). Original receipt of FDR signed & surrendered by customer. Filled in Banking Arrangement Letter. It is a loan offered to individuals for some given purposes and is to be repaid by equal monthly installments. No security is needed for this loan. The monthly installment is called EMI. EMI or Equated Monthly installment is the amount a customer has to pay every month to pay back the loan. Salaried, employees of MNCs, Large local corporate bodies, NGOs, International aid agencies, UN bodies, Airlines. Government employees, businessmen and self-employed professionals can also get this loan. Since no security is taken, the income of the applicant is given the prime consideration. Therefore, based on employment applicants are divided into segments. Segment 1: Executives of listed local corporate bodies and multinationals which have a corporate relationship with us have been maintaining their salary A/C with us and have a history of EOSB (End-of-Service-Benefit) payment of their employees through SCB accounts. Example: Executives of Lever Brothers, British American Tobacco Company, etc. Segments 2: Executives of Supra Nationalssector who have their salary A/C with us. Example: Executives of ILO, World Bank, ADB and other UN agencies. Segment 3: This segment is further divided into 3 categories. Institutes, NGO who have salary A/c with us only. Category 2: Employees of corporate bodies, Educational institutes, NGO who are paid salary through A/c with other banks. Category 3: Employees of corporate bodies, Educational Institutes, NGO who are paid salary in cash. Category 4: Self-employed professionals and businessmen. Since no security is taken for this loan, the bank considers the salary of the applicants as security. So we segregate the applicants based on their salary and Benefit relationship with us. That is why those whose employers have a corporate relationship with us, they get their salary through SCB and their employer keeps their pension and other staff benefit fund with us are in one segment. We feel that we can assess their income correctly and incase of default are in a good place to collect the remaining amount. UN agencies, ILO, ADB World Bank staffs are considered safe and reliable so they are in another segment. All the other are in segment-3. Segment-3 is considered more risky since it contains businessmen and executives who do not get their salary through us or in cash. As you will read through this module, you will learn that since we do not take any security, monthly income becomes very important in giving this loan. Segmentation is done based on their salary and pension. People working in garments, restaurants, car showrooms, trading/ indenting firms, lawyer, defense officials. The loan will be disbursed by crediting the account of the customer. If the applicant does not have an account with us an account is opened with “Zero balance” for the loan purpose. Customers will repay the loan by Monthly Installments. First payment will be within 59 days after loan disbursement. For Segment 1, 2 & Category 1 of Segment 3: The loan can be paid back in a minimum of 12 installments and a maximum of 60 installments. For Segments 3 (Category 2 & 3): The loan can be paid back in a minimum of 12 installments and a maximum of 48 installments. The penalty for missing an installment is that an additional 24% penal interest will be charged on the outstanding amount. This interest will be charged daily in the outstanding amount till the customer pays the outstanding. Customers can settle the loans before maturity. For that there is an early settlement fee. Incase the customer defaults on his installment payments, and then these documents will help us establish our right in court to liquidate his loan by en cashing customer’s security. Only the customer can sign on these documents. Bank employees or representatives must not sign or stamp a seal on these pages. Loan amount unto 75% of car value. Payable in a maximum of 60 monthly installments. Lowest interest rate in the market. With standard chartered auto loan if is easier than ever to buy the car one always wanted because only standard chartered offer the option of buying brand new car, reconditioned car or used car. Auto loan offers complete flexibility in structuring the loan. Customers can choose loan tenure, cash security requirement, loan amount and even the interest rate on their facility. Auto loan also offers an option of early settlement or partials payment of the loan if the need arises. There is no requirement to provide personal guarantee or cash security to qualify for an auto loan. If one chooses to provide 30% or more of the loan amount as cash security he will enjoy a higher loan amount and discounted interest rate. Auto loan is designed to make life easier. It offers easy repayment options and the freedom to choose repayment period-from 1 year to 5 years depending on the car. For better understanding installment amounts for different tenors for 100000 are shown in the followings. As of now there has been no formalized income assessment module for calculate income of applicants for auto lone. SCB have been using modules used for Flexi Loan to calculate incomes. While using these modules SCB have identified many loopholes and drawbacks, which SCB have addressed now. In the proposed modules used for different product are described below. For personal accounts, the customers must be in single name of joint names with spouse. To derive an individual’s income from company accounts with credit facilities (cc or project loan), firstly the company’s liabilities are deducted from the gross monthly credit turnover or average balance to derive the net credit turnover or average balance, respectively. Then the net figure is apportioned to the applicant as per his/her share in the business. Flexi Loan a partially secured loan facility given for any legitimate purpose. The loan can be either partially secured of fully secured. The security for the loan should be in a readily en-cashable form. Employees of reputed Loan Corporate, Multinationals, NGOS, private universities, International Aid Agencies, UN bodies and Airlines. Business experience less than 3 years. • Marriages in the family. Flexi Loan cannot be used for business purposes like working capital and buying industrial machinery. But doctors, architects. Cash, engineers who have private practices can use this loan to buy their office machines, office equipment’s” accessories or office renovation. Note: Readily en-cashable/ cash securities need to be acceptable to bank. How will one get the actual EMI amount from this table: After selecting the tenor (months) and the interest rate one has to multiply the loan amount in thousands with the corresponding factor and will have the EMI for that tenor and that interest rate. Non- Account Holder: The loan will be opening a new account with “zero balance” for the loan purpose. The number of maximum installments is not the same for all cases. It depends on the loan amount. Customers will repay the loan by Equal Monthly Installments (EMI). The repayment method is different for SCB AC holders and SCB non-A/C holders. • Customers A/C with SCB: They can put a standing order in their A/C that will automatically take the EMI every month. • Customers’ no prior A/C with SCB: They can give Post Dated Cheques (PDC) s for the of each month. A Demand Promissory Note, Letter of Continuation. Letter of Lien and Set-off over Deposit. Letter of Hypothecation these documents are called charge documents. Incase the customer defaults on his installment payments, then these documents will help us establish our right in court to liquidate his loan by en-cashing customer’s security. Only the or representatives must not sign or stamp a seal on these pages. Maximum loans amount 12 Lac. Tenor -5 years. 50% of sanctioned amount must be deposited as fixed. Rate of interest is 14%. A new era of consumer banking dawned on the 1st of march, 2004 when Bangladesh become the first country in the middle east and south Asia region of standard chartered bank to offer banking facility for the small and medium enterprise segment with BFS. Currently it is offering of Letter of Credit (L/C), guarantee, overdraft and Business loan. For an emerging economy like Bangladesh, the small and medium enterprise (SME) segment is the engine of growth .BFS is a prime manifestation of the bank’s focus on the market and introducing products and services that address the need of its chosen segment Business Loan has been a Hit in the market with total outstanding already reaching BDT 890 million at July end. SCB is the first foreign Bank to offer such packaged services in Bangladesh. The Standard Chartered Bank (SCB) is biggest bank in Asia, Africa and Middle East with its significant lending, investment, and insurance activities around the world. SCB is considered as one of the largest banking and financial services organization in the world. In Bangladesh, it has made its place as the fastest growing bank. Being able to work in this world-renowned organization I find myself lucky. I got the opportunity to work with SME department and in Project based works with SCB Bangladesh. During the three months of my internship I was placed in several locations, mainly at Head Office at Gulshan Avenue, under Masum Anwar, Manger, Sales. I heavily enjoyed the work of this department. The work experience gave me a good idea of the overall banking system of Bangladesh and taught me the professionalism at work place. Up to 3 years valid trade license, so that the customer proves a successful business man. Copy of last 12 months bank transaction statements. Photo ID of the business owner. Copy of utility bills of the business entity. Partnership deed and registration copy. All facility related offer letter. Usually, I used to check these information’s of the clients. For example, tiny information of one customer misses. Then it hampers the flow of work and delays the whole process as well as the performance of the employees. That is why; my task was so crucial for the department and requires intensive concentration too. Provide administrative support to the Project Manager and his/her team. Input site candidate information into a project database. Track all development project activities through the maintenance of the project tracker. Assist with the coordination of site visits. Create and maintain site files. Log, produce & track all Purchase Orders including receipt and payment. Prepare and disseminate close-out packages to client. Develops work plans and timelines. Coordinates project planning and activities, monitors project progress, and prepares documentation and reports as required by the funded. Develops project linkages to other activities and groups related to the project. Conducts and evaluates research and synthesizes information regarding best practices in the relevant project task areas. Completes review and reporting requirements to ensure that project activities receive timely review and that no activity proceeds until appropriate review has been conducted and any necessary approval received. Develops and monitors contracts with external vendors selected to conduct project activities. Attends various meetings and conferences to both promote the quality choices for main project and to establish collaborative linkages with other agencies and organizations. Assists with the design and compilation of data into project reports, databases, web pages, and other information organization and presentation tools. To plan and direct the preparation of resources and resource information in accordance with divisional priorities, ensuring best value, probity in the use of resources, maximization of income and professional practice within the service areas. To ensure the establishment of appropriate processes for the administration, management and monitoring of such projects. To ensure that all management information is collected, collated, analyzed and used to report to central government, inform strategic and operational planning and enable services to be delivered with specific outcomes. To ensure that there is an appropriate strategy in place to enable the Division to carry out its core functions through the use of effective IT systems. To lead on and contribute to the development and maintenance of the Division’s project planning process. To ensure that the Division is fully able to respond to changes in legislation, new policies and all planning and priorities guidance issued by government. To ensure that the Division produces high quality information for the public reflecting at all times the diverse nature of the community being served. To contribute to, and participate in, departmental and corporate working parties, initiatives and projects as required. To ensure the provision of documents and information as needed to demonstrate the effective implementation of policy and operation of the division in accordance with the relevant performance standards. To undertake training and constructively take part in meetings, supervision, seminars and other events designed to improve communications and assist with the effective development of the post and post holder. At all times carrying out responsibilities/duties within the framework. SS and CRES which implies Strategic Sourcing and Corporate Real Estate service is an integral part of Standard Chartered Bank. SS and CRES can be defined as a portion of administrative department which mostly functions are administrating, ATM, branch, vendor management and bill payment etc. The most critical aspect of this department is its suggestion and demonstration in achieving strategic compatibility and advantage over the competitors which maintaining a prospects for future growth in the industry. Its function also includes the management of real estate service providers and as well maintaining good terms with the land-lords (present and potentials). SS and CRES are sought responsible for all strategic implications of Standard Chartered Bank through out Bangladesh. Any decision of investment inside Bangladesh has to be approved by the senior management of this department which as well might also include setting up a new branch as ATM booth. The senior management comprises of four to five members and before approving they analyze, interpret every project in terms of cost and benefit to determine the best project of the bank. The department also focuses on continuous upgrading of technology and management systems which enables Standard Chartered Bank to offer new services and products to the customers while maintaining an extensive international network for the benefit of the customers. The project cost is determined by Finance Department and the head of the project, which is being calculated as 2.5 Crore taka. This cost only includes the formalization and fulfillment of the project. Any cost related to ATM set up, branding or utilities are to be excluded from this budget. The extra cost will fall under ATM administration and branding division which will be paid by the relevant sectors. ATM project shall be dealing materials and concerns subject to ATM installation and properly rent. Any concern of the branch administration or ATM service problem will not be directly authorized by this project or project members. Any asset of the project shall not be used for the purpose serving any other division or sector of Standard Chartered Bank. In case of decision concerning ATM installation, the project member’s opinion will be deemed final and thus the members would be held responsible for any problem aroused in the near future. Each of these steps which can be divided into several sub sections is the integral part of ATM project. These steps will be explained in the later chapters while trying to demonstrate its importance in the project life. Standard chartered bank declaring the ATM project as a priority of all the strategic implications shall provide the project will all necessary utensils and service required as urgent basis. The project had been held important in order to gain competitive advantage over the competitors which are BARC bank, Dutch-Bangla Bank, CITI Bank, Dhaka Bank etc. Most of Standard Chartered Bank’s competitors are willing to grasp the most percentage of the market share possible through providing bank service via ATM or branch and thus Standard Chartered in order to gain competitive advantage would have to provide the service as soon as possible. In such circumstances, the ATM project is held very important for the future prospect of the bank. procedure should be easy and customer friendly. Say for example to have loan from Dhaka Bank Ltd people will have to open an account with the bank. But the bank requires introducer to open an account. Sometimes it happened that a customer got approved to have loan from the Head office, didn’t manage to get an introducer for the account opening. So Dhaka Bank should make the whole procedure easier for the customers to enjoy the personal loan from them. The following table will summarize a comparative picture of organizational support between Dhaka Bank Ltd and Standard Chartered Bank. This table depicts that Dhaka bank ltd is lagging behind with Standard Chartered Bank in terms of organizational support. So without having strong organizational support in compare to the competitor, it will be hard for Dhaka Bank Ltd to survive in the market. The coming year will be tougher for banks to survive in this competitive world. More banks are coming up and banking law has been becoming more rigid for the banks. Money laundering, loan defaulter, corruption, volatile capital market, classified loan, unstable world economy, terrorist attack, all these issues are becoming very crucial for the banks to make their vision, mission, policy, procedure. That’s why all the banks in the world are now diversifying their business introducing new products and services and increasing their productivity and efficiency. Therefore, Dhaka Bank Ltd will have to bring latest technology and improve their quality of service if they want to make a stable position in this market. The main purpose of the report was to focus on the lending services to its valuable customers and the consumer banking services provided by Standard Chartered Bank as comprehensively as possible. Although I did not have much time to learn the whole procedures but it was supportive to understand and gather an initial banking management experience. As the long-term performance of any organization depends on its intake of qualified people and developing them to perform their best as a team, as well as individually. To cope with the recent challenges of banking sector Standard Chartered Bank is creating an environment where employees are happy to build their career and customers feel good doing business with them. Face to face interaction with PFC and other credit personnel to get in depth information. Primary information sources, such as information gathered at the time of customer service. Secondary information sources, such as product brochures, different printed format, manual and guidelines for PFC, Booklet of Loan application. Out serve Newsletter-Bangladesh (2009) volume, issue 2 & 3. Prior research work and reading material on this topic.